That first project took eight years to complete. Meanwhile Judy experimented with this newfound passion. Her next effort was a small lap quilt, made by machine quilting around a large, bold Meri Mekko print. Rather radical for the time! 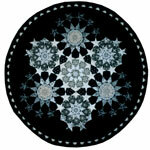 However, she soon discovered the joy of drafting complicated geometric patterns and spent the next decade exploring a variety of star patterns and complex Islamic mosaic designs that were based on the equal division of a circle. 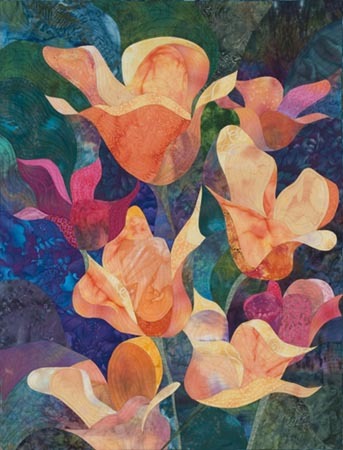 These wallhangings were mostly hand pieced and quilted, and the resulting collection was exhibited at a one-woman show at the New Jersey State Museum and earned Judy two Fellowship Grants from the New Jersey Arts Council. Judy feels fortunate to have begun her career in a state that not only recognized quilts as art but also encouraged fiber artists by providing exhibition opportunities and financial support. 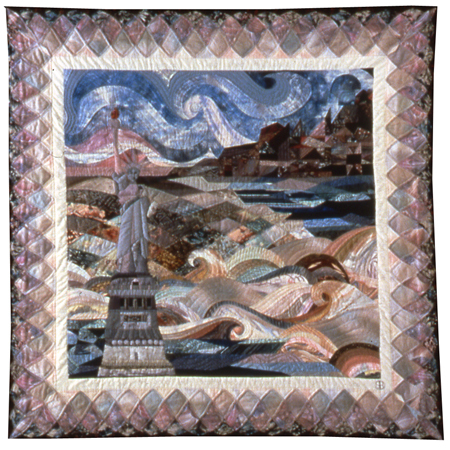 It was at this time, (1986) that Judy’s work took a dramatic turn as the result of creating a quilt for the Great American Quilt Contest, part of the centennial celebration for the Statue of Liberty. 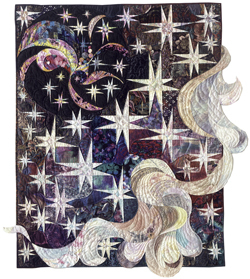 Judy’s quilt, America, The Beautiful, was the New Jersey winning quilt, earned a Judges’ Choice award and was purchased by the Newark Museum for their extensive quilt collection. But more importantly, it was this quilt that introduced Judy to curves. The challenge of depicting “spacious skies”, “shining seas” and “amber waves of grain” led Judy to create and piece a design that was composed mainly of curved seams and the rest, as they say, is history. Judy was captivated by pieced curves, feeling they added a lyrical, feminine quality to her work and truly opened the door to creativity. Her quilts instantly became more expressive, personal and distinctive, and she discovered that she had a real affinity for curves. She developed a pattern and piecing method that allowed very precise rendering of her designs, which she felt was critical. Each design goes through a number of revisions until every curve and shape is perfect, so it is important that each line be reproduced faithfully when translated to fabric. Judy’s curved-seam quilts did not go unnoticed and she began exhibiting and teaching worldwide. She soon discovered that classes based on curved-seam piecing needed to include information about drawing and designing with curves so that students could create their own original work. She also discovered that working with talented students was stimulating and rewarding, often returning from a teaching trip more energized and motivated than when she left. Judy’s book, Curves In Motion, was published in 1996 and remains the definitive text on designing and piecing curved-seam designs. Unfortunately, the book is out of print but occasionally copies become available on-line. In 1993, Judy was honored to have her quilt, Spirit Flight, included in The White House Collection of American Crafts. The seventy pieces included wood, clay, metal, glass and fiber, and were made by some of the best-known craft artists in the country. Originally exhibited in December 1993 in the White House, the collection toured the country for several years. Spirit Flight is a very personal quilt. The imagery has special significance for Judy and working on the quilt helped her after the death of her mother. Michael Monroe, director of the Renwick Gallery at the time, and curator of the White House Collection told Judy that he choose her quilt for inclusion in the collection because he was very taken with it and that it "spoke” to him. Judy considers this the highest praise an artist can receive and is pleased that the personal aspects of the quilt are obvious to viewers. Dancing On The Dark Side of the Moon was chosen in 1999 as one of the 100 Best Quilts of the 20th Century. 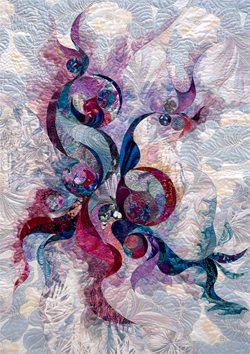 A panel of experts in the fiber field choose the quilts to be so honored, The collection was then exhibited at the Houston International Quilt Festival and a book was published by C&T Publishing. Two of Judy’s quilts were selected, but the one that was finally chosen is one of Judy’s personal favorites. It was designed and created quite effortlessly and the joy associated with its creation seems to emanate from the quilt. 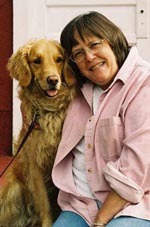 Judy lives in a small village in the Northeast Kingdom of Vermont that was her childhood home. She has retired from traveling and teaching, but finds that living in such a beautiful and peaceful place nurtures her creativity and informs her work. She still prefers piecing to other techniques because it imposes a certain discipline on the design process and challenges her to distill and purify the imagery. Occasionally she experiments with painting, stamping, dying and silk screening and will often embellish the pieced work with layers of transparent fabric (chiffon and tulle) to create watercolor type effects. The additional layers enrich the color and plump the design, creating both depth and complexity.